Team grafts world's first low deck, all aluminum Hemi and T56 six speed gearbox into '70 Challenger resto-mod. Resto-mod tech: how to refurbish an expensive grill, insulate a uni-body plus tips on reassembling brightwork. WD-40 300004 Specialist Rust Release Penetrant Spray, 11 oz. (ANNOUNCER)>> TODAY ON DETROIT MUSCLE IT'S THE START OF A BRAND NEW PROJECT. THE GUYS GO ON THE HUNT FOR THEIR NEXT BIG BUILD AND DO SOME DETECTIVE WORK TO UNCOVER THE IDEAL CANDIDATE. ALSO WE'LL GO FOR A SPIN IN ONE OF THE MOST FAMOUS MOPARS OF ALL TIME. DETROIT MUSCLE STARTS RIGHT NOW! EXPLORING BONE YARDS AND BARNS. WE'VE PLAYED DETECTIVE BY DECODING CARS TO REVEAL THEIR FACTORY ORIGINS. (TOMMY)>> WE'VE SHARED TIPS ON HOW TO LOOK FOR PROJECT CANDIDATES. AND MOSTLY WE'VE JUST GOT A KICK OUT OF SEEING WHAT WE COULD UNCOVER. (JOE)>> BUT THIS TIME WE MEAN BUSINESS. IN FACT, WE'RE ON A SERIOUS HUNT FOR OUR NEXT PROJECT VEHICLE. (TOMMY)>> YEAH WE'VE GOTTEN WORD FROM A FRIEND OF A FRIEND OF A FRIEND THAT'S GOT SEVERAL OF THOSE PROJECT CARS. SO WE THOUGHT WE'D COME CHECK HIM, WE CAME PREPARED. WE'VE GOT SOME CASH AND A TRAILER, AND HOPING WE GO HOME WITH SOMETHING. (JOE)>> MARK TUCKER'S AUTOMOTIVE SHOP'S IN LINCOLN COUNTY TENNESSEE. NOW FROM THE HIGHWAY YOU'D NEVER KNOW WHAT LIES BEHIND IT. A BEVY OF OLD BEAUTIES MARK HAS AMASSED OVER YEARS OF WHEELING AND DEALING. (MARK)>> WELL I'VE BEEN COLLECTING PROBABLY AROUND 17, 18 YEARS. (JOE)>> ARE ANY OF THESE FOR SALE? (MARK)>> VERY, VERY FEW, MOSTLY NONE OF THEM. OF GNARLY, PRICKLY THISTLE EVERYWHERE. (JOE)>> TOM DID YOU KNOW THAT THISTLE IS ACTUALLY THE NATIONAL SYMBOL OF SCOTLAND? IN FACT, ACCORDING TO SCOTTISH LEGEND, SOME WARRIORS WERE SAVED ONE NIGHT WHEN THEIR INVADERS, BARE FOOT OF COURSE, STEPPED ON THISTLE, AND OH WELL. (TOMMY)>> LOOK AT THIS, '57 DODGES WERE A SYMBOL OF WHAT CHRYSLER ONCE CALLED THE FORWARD LOOK. IT KINDA LOOKS LIKE IT'S MOVING, EVEN THOUGH IT'S BEEN PARKED HERE FOR YEARS. (JOE)>> IN THE SPANISH LANGUAGE CALIENTE MEANS HOT. THIS FOUR DOOR SEDAN IS LUKEWARM AT BEST. (TOMMY)>> CHEVELLE TWO DOOR WAGONS ARE PRETTY RARE, AND I'LL BET MARK WOULD EVEN THROW IN THE DICE IF WE WERE GAMED FOR ANOTHER GROCERY GETTER. LIKELY TO LET GO OF. (TOMMY)>> THIS '71 PLYMOUTH DUSTER WOULD MAKE SOMEBODY A NICE PROJECT CAR. PROBABLY NOT US, BUT IT'S WORTH A LOOK. JOE IS IT RUSTY ON THAT SIDE? (JOE)>> I DON'T KNOW. WOW, PLYMOUTH SATELLITE, THIS ONE'S IN PRETTY GOOD SHAPE TOO. YOU KNOW, THIS IS CONSIDERED AN ENTRY LEVEL MOPAR TO A LOT OF PEOPLE, AND SOME PEOPLE TAKE THESE AND TRY TO TURN THEM INTO SOMETHING THEY'RE NOT, WHICH IS NOT VERY COOL TO US. IF WE GET A MOPAR, WE'RE GOING TOP SHELF. SOMETHING LIKE THIS, 1970 CHALLENGER R/T, ONE OF THE MOST DESIRABLE, SOUGHT AFTER MUSCLE CARS IN THE WORLD. OF COURSE SOME PEOPLE WOULD REFER TO THIS ONE AS A BASKET CASE. (TOMMY)>> AT FIRST GLANCE IT CAN BE REALLY INTIMIDATING, BUT THE BEAUTY BEHIND BUYING A CAR IN THIS STYLE CONDITION, WELL SOME OF THE WORK OF DISASSEMBLY IS ALREADY DONE AND YOU GET TO SEE EXACTLY WHAT THE CONDITION OF THE BODY IS IN. IT'S KINDA LIKE THIS SHIFTER HOLE HERE. NOW I CAN TELL YOU IT LOOKS LIKE SOMEBODY'S CUT IT OUT WITH A TORCH AND A PAIR OF VICE GRIPS. BUT IT'S NO BIG DEAL, IT CAN BE REPAIRED. BUT YOU WOULD NEVER SEE THIS WITH THE SHIFTER BOOT AND THE CARPET LAYING IN PLACE. 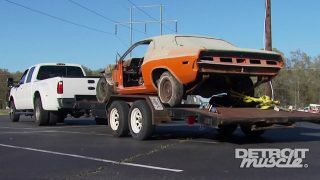 (JOE)>> WELL THIS OLD CHALLENGER'S MISSING AN ENGINE AND TRANS, WHICH IS FINE WITH US CAUSE WE'VE GOT PLANS WE'LL TELL YOU ABOUT LATER. IT'S ALSO MISSING A FENDER TAG, WHICH USUALLY GOES THERE, THAT TELLS YOU ABOUT ALL THE OPTIONS. NOT TO WORRY THOUGH, STILL GOT THE VIN NUMBER AND THAT TELLS US A LOT TOO. "J" IS THE LETTER DESIGNATION FOR CHALLENGER. 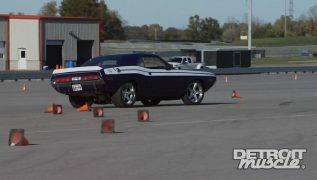 UH OH, THIS TELLS US IT'S A BASIC CHALLENGER, NOT AN R/T, OTHERWISE THIS WOULD BE AN "S". TWO AND THREE TELLS US IT'S A TWO DOOR COUPE. THIS NEXT LETTER IS FOR THE ENGINE TYPE, A 318. ZERO MEANS 1970, "B" TELLS US IT WAS ASSEMBLED IN HAMTRAMCK, MICHIGAN. WRONG WITH DROPPING IN A BIG OLE BAD, OH WHAT'S THAT ICONIC ENGINE, STARTS WITH AN "H", ENDS WITH AN "EMI"? (TOMMY)>> NOW THIS CAR BEING ON A ROTISSERIE IS A HUGE HELP, ESPECIALLY WITH THE INSPECTION SIDE OF IT. NOW LOOKING AT THIS CAR, IT'S GOT SOME RUST IN THE TRUNK PAN, WHICH ISN'T NO BIG DEAL. AND I'VE HEARD FROM A FEW OF THOSE MOPAR GURU'S, THEY ALMOST THINK THESE CARS WERE SHIPPED FROM THE FACTORY WITH A LITTLE BACK HERE ABOVE THE TANK. (JOE)>> WELL A LITTLE RUST LIKE THIS, NO BIG DEAL ON A CAR LIKE THIS. I'M KINDA EXCITED, WHAT DO YOU THINK? (TOMMY)>> YEAH, IF THE DOORS AND FENDER IS AS NICE AS THE CAR ITSELF, WE'VE GOT US A CANDIDATE. WE'LL JUST HAVE TO SEE IF WE CAN GET IT HOME TODAY. (JOE)>> LET'S GO TALK TO HIM. (TOMMY)>> GETTING THE DEAL DONE WAS A LOT EASIER THAN GETTING THE CHALLENGER OUT OF THE LOT AND ONTO OUR TRAILER. BUT AT LAST, WE'RE HOMEWARD BOUND WITH WHAT PROMISES TO BE OUR MOST EXCITING PROJECT EVER. 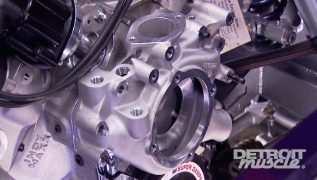 (ANNOUNCER)>> UP AHEAD, THE TEAR DOWN BEGINS, AND WE'LL TALK ABOUT WHAT YOU WANT TO SAVE AND HOW TO MAKE SURE YOU GET IT BACK WHERE IT'S SUPPOSED TO GO. THEN THIS PRISTINE WHITE CHALLENGER HIDES MORE THAN JUST A HEMI. FIND OUT WHAT MAKES IT SO SPECIAL UP AHEAD. (JOE)>> WELL WE MADE IT BACK TO THE SHOP IN ONE PIECE WITH OUR NEWLY ACQUIRED '70 CHALLENGER. OF COURSE IT'S IN SEVERAL PIECES, AND HAPPY TO SAY THAT THE FENDERS AND DOORS, LIKE THE REST OF THE BODY WE SHOWED YOU, ARE IN GREAT CONDITION CONSIDERING THEY'RE ALMOST 45 YEARS OLD. CASE IN POINT, NO RUST AT THE BOTTOM OF THIS DOOR, ESPECIALLY IN THE CORNER WHERE YOU OFTEN FIND IT IN CARS THIS OLD. AND LOOKS LIKE ORIGINAL PAINT TOO. (JOE)>> THE STEERING COLUMN GETS DETACHED FROM THE BOX. THEN A COUPLE OF BOLTS MEAN IT CAN BE REMOVED. THE DASH IS A LITTLE MORE INVOLVED WITH SOME PRETTY TRICKY BOLTS TO DEAL WITH. BUT LIKE EVERYTHING ELSE, IT COMES OUT TOO. THEN THE HEATER BOX IS AN EASY VICTIM, AS WELL AS THE PEDAL ASSEMBLY. TO TAKE REALLY GOOD CARE OF. OOPS, JUST A FEW SCREWS IS ALL IT TAKES FOR REMOVAL. GOOD DEAL, SAVED IT! AND REAR, DEPENDING ON THE SHAPE OF THE ROOF, HAVE GOT TO GO BACK THE WAY THEY CAME. SOME OF THESE BOLTS ARE PRETTY STUBBORN AND RUSTED. SO WE'LL BUST OUT A CAN OF WD 40 RUST PENETRANT TO MAKE REMOVING THEM EASIER. 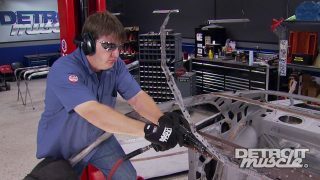 (TOMMY)>> WE'LL USE A JACK TO HOLD UP THE KMEMBER AND FOUR BOLTS IS ALL IT TAKES TO DROP IT OUT OF THE CAR. WELL WE'VE GOT OUR CONTROL ARMS DISCONNECTED, THE FOUR BOLTS THAT HOLD THE KMEMBER OUT. THEN WE WENT AHEAD AND RELEASED ALL THE PRESSURE OFF THE TORSION BARS. NOW OFTEN TIMES I'VE SEEN GUYS CUT THESE OUT BECAUSE THEY CAN BE SUCH A PICKLE TO GET OUT. WE'RE NOT GONNA DO THAT TODAY. (JOE)>> THAT'S RIGHT, THE THEORY IS, IF WE PUSH THOSE TORSION BARS FORWARD ENOUGH, THE KMEMBER AND EVERYTHING ATTACHED TO IT COMES OUT. AND TO MAKE THAT HAPPEN MY FAVORITE TOOL, HERE YOU GO. (TOMMY)>> WHY YOU HANDING IT TO ME IF IT'S YOUR FAVORITE TOOL? (JOE)>> NOW WE CAN MOVE ON TO THE REAR SUSPENSION. THIS LEAF SPRING SETUP IS A PRETTY FAMILIAR CONFIGURATION FOR MUSCLE CARS. WE'LL UNBOLT THE SHACKLES ON THE BACK OF THEM, AND KNOCK THEM APART WITH A HAMMER. THESE SUPER RAD AIR SHOCKS WERE A BIG DEAL BACK IN 1983, BUT WE DON'T THINK THEY'LL BE INCLUDED IN THE REBUILD. THEN THE FRONT PERCH CAN BE REMOVED WITH FOUR BOLTS, AND THE REAR END IS NOW DETACHED FROM OUR MOPAR. SAME WITH PRETTY MUCH ANY VEHICLE ONCE YOU FIND A GOOD ATTACHMENT POINT. WE CAN ROLL IT OUT AND MAKE A SHORT TRIP TO THE BLASTER. YOU KNOW, I'M GONNA MISS THIS COOL MANGO PAINT. (ANNOUNCER)>> STILL TO GO YOU WON'T WANT TO VANISH. IN FACT, YOU SHOULD MAKE IT A POINT TO STAY AND CHECK OUT THIS VICIOUS EBODY. IT'S GOT MORE TOP SHELF 1970 GOODIES THAN YOU CAN SHAKE A STICK AT. THEN WE'LL TALK ABOUT WHAT WE'RE GONNA DO WITH OUR OWN CHALLENGER. WE'VE GOT SOME BIG PLANS! (JOE)>> HEY, DID YOU GUYS KNOW THAT A DODGE CHALLENGER WAS THE STAR OF A MOVIE CALLED VANISHING POINT IN 1971? IN FACT, FIVE IDENTICAL WHITE ONES WERE USED IN PRODUCTION. (TOMMY)>> ALL FIVE WERE CRUSHED WHEN PRODUCTION WAS OVER WITH, BUT THANK GOODNESS FOR CLASSIC CAR MOVIE REMAKES. (JOE)>> ABOUT 25 YEARS LATER A VANISHING POINT REMAKE WAS IN THE WORKS, AND THE PRODUCERS CALLED ON STEPHEN'S PERFORMANCE FOR HELP GETTING CHALLENGER PARTS. (TED)>> THEY JUST STARTED SENDING THE GROCERY LIST OVER AND WE STARTED SHIPPING PARTS. (TOMMY)>> THE MOVIE WAS FINISHED IN 1997. 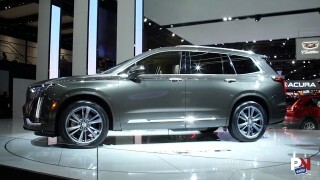 THIS TIME THOUGH, INSTEAD OF THE CRUSHER, THE FIVE WHITE CHALLENGERS USED IN THE PRODUCTION WENT TO THE AUCTION BLOCK. MUSEUMS FOR DISPLAY, BUT THIS ONE FIRST GOT A COMPLETE RESTORATION. EVEN WITHOUT STAR STATUS, THIS '70 R/T IS A BONAFIDE BEAUTY. (TED)>> YEAH, THIS ONE WAS THE HERO CAR OR THE MAIN CAMERA CAR. IT WASN'T AS TORN UP AS THE REST OF THEM WERE. (JOE)>> IT SITS ON CORRECT F-60 15 POLYGLASS TIRES WITH RALLY WHEELS. IT CAME WITH SOME OPTIONS LIKE STEERING WHEEL WITH A RIM BLOW HORN PAD, HOUNDS TOOTH AND VINYL BUCKET SEATS, AND BEHIND THAT FAMOUS PISTOL GRIP A SPECIAL DRESS UP FOR THE PEDALS. (TOMMY)>> TED RECENTLY TOOK IT OFF DISPLAY TEMPORARILY TO FRESHEN UP THE 426 HEMI. AND HE REALIZED A SERIOUS PERSONAL OMISSION. IN ALL THESE YEARS HE HAD NEVER DRIVEN THIS STAR CAR. THAT HAD TO CHANGE! (TED)>> JUST LIKE DRIVING A NEW CAR. IT'S NOT GOOD FOR A CAR TO SIT. (JOE)>> THE CHALLENGER BODY STYLE WAS THE SAME THROUGHOUT ITS PRODUCTION RUN. YOU COULD SPOT A '70 MODEL BY ITS DEEPLY RECESSED GRILL, SET BACK BEHIND THE DUAL HEAD LAMPS. MOST R/T'S CAME WITH A POWER BULGE HOOD, TWO AIR INTAKES, NOT DIRECTLY CONNECTED TO THE AIR FILTER. THIS MODEL EVEN HAS A CHROME FLIP OPEN RACE STYLE GAS CAP. THE REAR LIGHTS ARE IN A FULL WIDTH UNIT WITH A SINGLE REVERSE LAMP IN THE MIDDLE. (TED)>> SUPPOSEDLY TOO NICE TO DRIVE, BUT WE'RE DRIVING IT ANYWAY. IT'LL CLEAN UP. TO SHARE IT WITH ITS FANS. (JOE)>> TODAY THOUGH IT ALMOST SEEMS PROUD TO PROVE IT'S A CHALLENGER R/T WITH ENOUGH HORSEPOWER TO MATCH ITS STAR POWER. ARMED TO THE TEETH UPGRADED ANIMAL? (TOMMY)>> HEY GUYS, WE'RE AT BLAST FROM THE PAST AND YOU'VE SEEN US USE THEM A NUMBER OF TIMES. WE'RE DROPPING OFF OUR DODGE SO THAT WE CAN GET IT STRIPPED DOWN AND READY FOR SOME COLOR. BUT BEFORE WE DO ALL THAT, I'D LIKE TO TALK ABOUT THE MEDIA AND ITS PURPOSE. NOW YOU ALL SEEN THIS FELLA. IT'S VANCE, AND HE'S PRETTY MUCH THE HEAD HONCHO HERE AT THE SHOP. I SEE YOU LAID OUT A FEW OF THE MEDIAS, WHAT DO YOU GOT? (VANCE)>> WE'VE GOT SOME WALNUT SHELL, WE'VE GOT SOME BLACK BEAUTY, AND CRUSHED GLASS. (VANCE)>> THESE RIGHT HERE, THE BROWN IS THE WALNUT SHELLS. WE USE IT ON VERY LIGHT STUFF LIKE CORVETTES, ANYTHING WOOD, WOOD CHAIRS, ANY THING THAT NEEDS SOMETHING SOFT AND DELICATE. (TOMMY)>> NOW THIS STUFF IS COAL SLAG, OR WHAT'S REFERRED TO AS BLACK BEAUTY RIGHT? (TOMMY)>> SO WHAT DO YOU GUYS USE THAT FOR? (VANCE)>> WE USE IT ON OUR ROUGH MATERIAL SUCH AS THICK METAL AND STUFF THAT WE JUST WANT TO RIP THE RUST AND PAINT OFF OF RIGHT QUICK. (TOMMY)>> NOW THESE OTHER TWO ARE CRUSHED GLASS. ONE'S A NUMBER FOUR, AND ONE'S A NUMBER THREE, AND WHAT THE NUMBER REFERS TO IS HOW FINELY THEY'RE GROUND. WELL I GUESS WE BETTER GET OUT OF YOUR WAY AND LET YOU GET BACK TO BUSINESS. I CAN FIND SOMETHING TO DO. (VANCE)>> YEAH, WE'VE GOT TO GET THAT THING FINISHED. (TOMMY)>> I'LL SEE YOU IN A COUPLE OF DAYS. YOU KNOW IT'S A FUNNY THING, BUT WE'VE HAD TALKS ABOUT WHAT WE LIKE ABOUT THE 1970 DODGE CHALLENGER EVEN BEFORE WE GOT ONE. AND WE ALSO TALKED ABOUT HOW WE COULD MAKE A GREAT THING EVEN GREATER. WE LIKE THE UNMISTAKABLE SHAKER HOOD OPTION, AND WE LIKE THE FACT THAT THEY WERE BUILT TO GO FAST, WITH ENGINE OPTIONS LIKE THE 440 AND 426 HEMI. WE ALSO LIKE THE IDEA OF A MANUAL FOUR ON THE FLOOR TRANS WITH A PISTOL GRIP SHIFTER. AND THE FACT THEY CAME IN SUCH BRIGHT, CRAZY COLORS. DONE BY OUR FRIEND DALE SWANSON AT SWANSON ARTWORK, WHO DOES A LOT OF OUR PREBUILD ART. THE COLOR'S WHAT THE FACTORY CALLED PLUM CRAZY PURPLE IN 1970. SO WE'RE PROUDLY NAMING OUR PROJECT CAR ULTRA VIOLET. HE EVEN GAVE US A PERSONAL SLANT ON THE CLASSIC R/T STRIPES. SO THAT'S OUR GAME, TAKE THE ICONIC PARTS OF THIS CAR AND RAMP THEM UP TO THE MAX. (JOE)>> BUT DON'T WORRY, WE'RE KEEPING THE CLASSIC LOOKS AND STYLING TO MAKE THIS CAR ONE OF THE MOST REVERED RIDES OF THE MUSCLE CAR ERA. 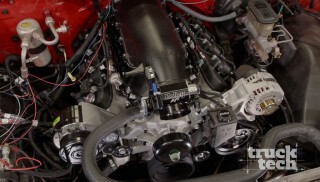 IF YOU'RE THINKING ABOUT UPGRADING THE STEERING COLUMN IN YOUR MUSCLE CAR, YOU MIGHT BE GLAD TO KNOW AMERICAN POWERTRAIN IS NOW THE SINGLE SOURCE FOR COUNTLESS TURN KEY SYSTEMS, ANYTHING THAT I DID IT MAKES, WELL LIKE THIS FIRST GEN CAMARO COLUMN WITH INTEGRATED ELECTRIC POWER STEERING. THEY'RE MADE FOR QUIET OPERATION, THEY'RE SPEED SENSITIVE, AND A BREEZE TO INSTALL. USUALLY IT'S A SIMPLE SWAP WITH ONLY A FEW WIRES TO DEAL WITH. THEY'RE GREAT FOR WORKING IN TIGHT SPACES. THEY WORK WITH EXISTING ALTERNATORS WITH ZERO PARASITIC POWER LOSS. 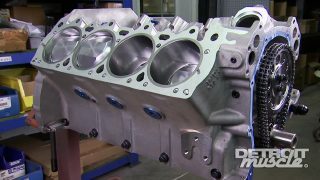 LIKE A SAID THE APPLICATIONS ARE MANY, THE SOURCE IS ONE, AMERICAN POWERTRAIN. (TOMMY)>> WHEN YOU INVEST YOUR HARD EARNED MONEY INTO AN AIR RATCHET, YOU WANT TO MAKE SURE THAT IT'S POWERFUL, DEPENDABLE, AND USER FRIENDLY. THIS HEAVY DUTY UNIT FROM MATCO, IT'S GOT 130 FOOT POUNDS OF TORQUE. IT HAS A QUICK VARIABLE SPEED TRIGGER WITH ONE FINGER OPERATION, AND IT'S GOT BEARINGS ON BOTH SIDES OF THE GEARING TO REDUCE FRICTION. THAT'S GOOD FOR LONG LIFE AND SMOOTHER OPERATION. PLUS IT'S GOT THIS ERGONOMIC SHIFT KNOB DESIGNED TO MAKE CHANGING DIRECTIONS EASIER THAN EVER. IT'S AVAILABLE ONLINE FROM MATCO FOR AROUND $400 BUCKS. (TOMMY)>> EVERYBODY WANTS QUALITY TOOLS, BUT WHAT ABOUT QUALITY COMFORTABLE WORK CLOTHES. RED CAP'S NEW PERFORMANCE WORK PAINTS AND SHORTS ARE MADE OF A TOUGH YET SOFT FLEXIBLE MATERIAL. THEY HAVE HIDDEN CLOSURES TO COVER THE BUTTONS, AND FEATURE EASY ACCESS SPECIALTY POCKETS. THE PANTS FEATURE A DUAL JOINT KNEE DESIGN FOR EASY BENDING AND FLEXING. THEY'RE AVAILABLE IN THREE COLORS AND EXCLUSIVELY FROM RED CAP. WELL TIME TO BUTTON UP ANOTHER EDITION OF DETROIT MUSCLE, WE'LL SEE YOU NEXT TIME.